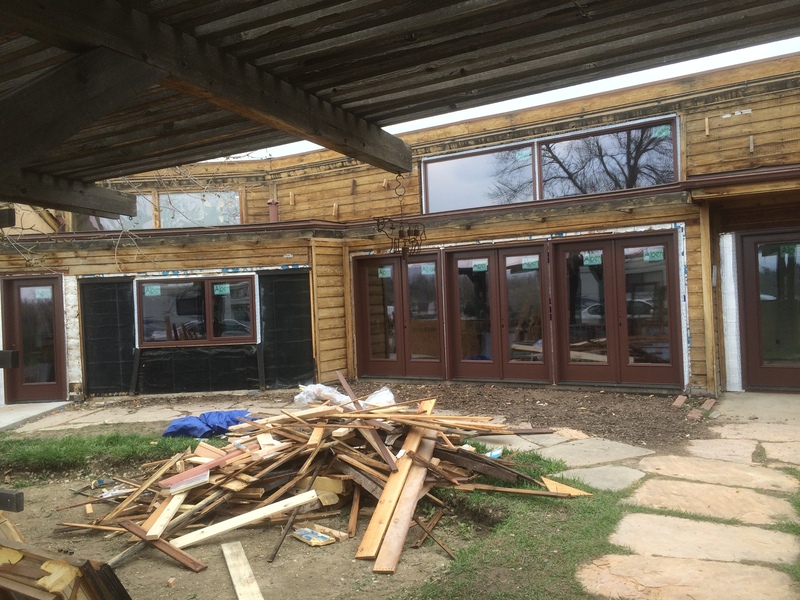 New windows and doors are the most expensive and largest change to the house since the new slab was installed. And it is finally happening! We ordered the Alpen windows and ThermaTru doors with Alpen glass inserts from Mark Attard at AE Building Systems and he recommended the Efficiency Matters company for installation as they are trained in Alpen window installs and also the Siga air barrier systems. 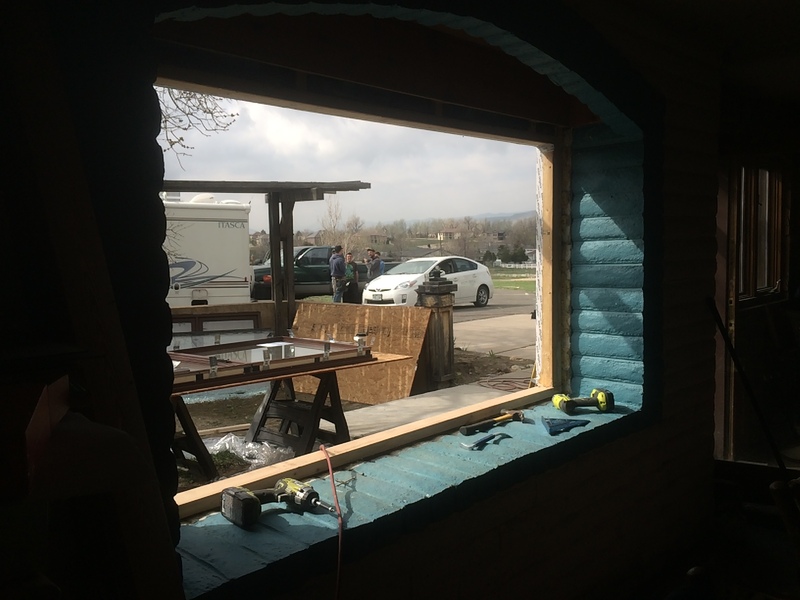 Alpen is a local window, manufactured in Longmont Colorado and the most energy efficient made in the USA. 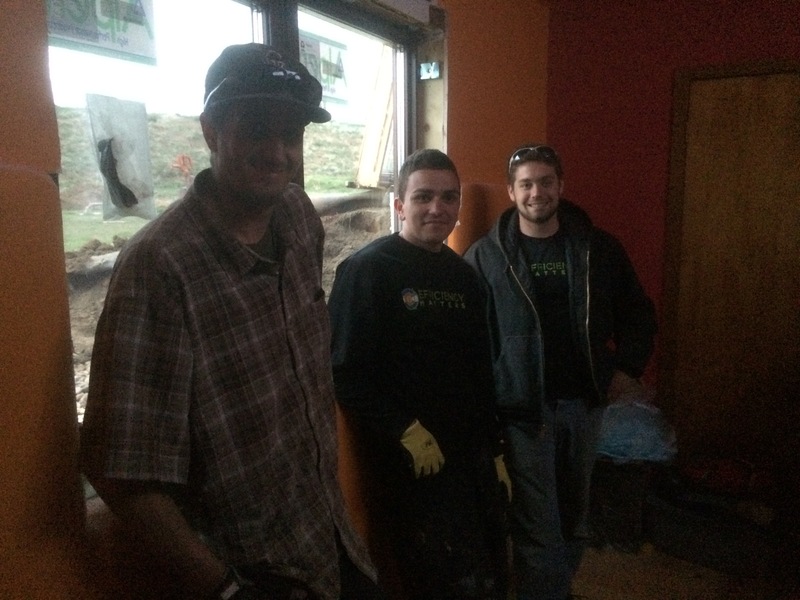 Last week the Fort Collins based crew arrived to take out the old and put in the new. 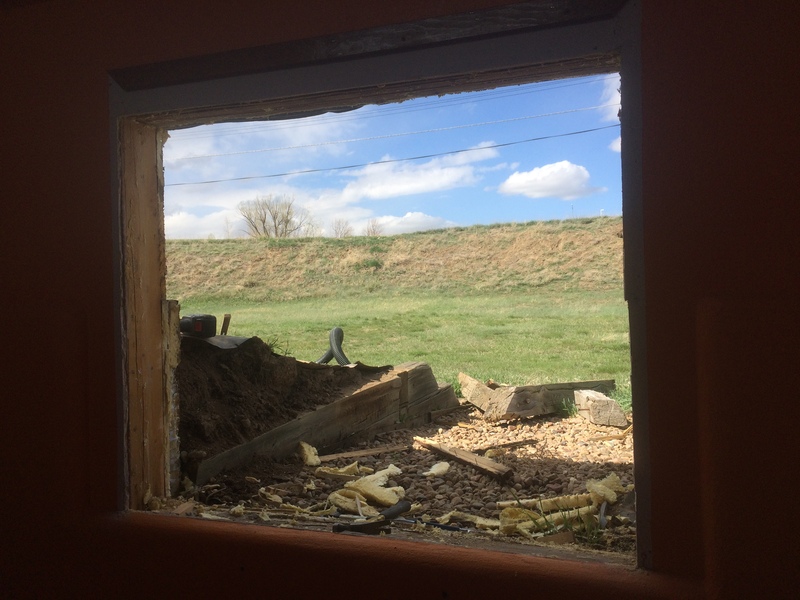 After installing a couple of the master bedroom windows just to get started, a separate crew came to reframe the door openings. 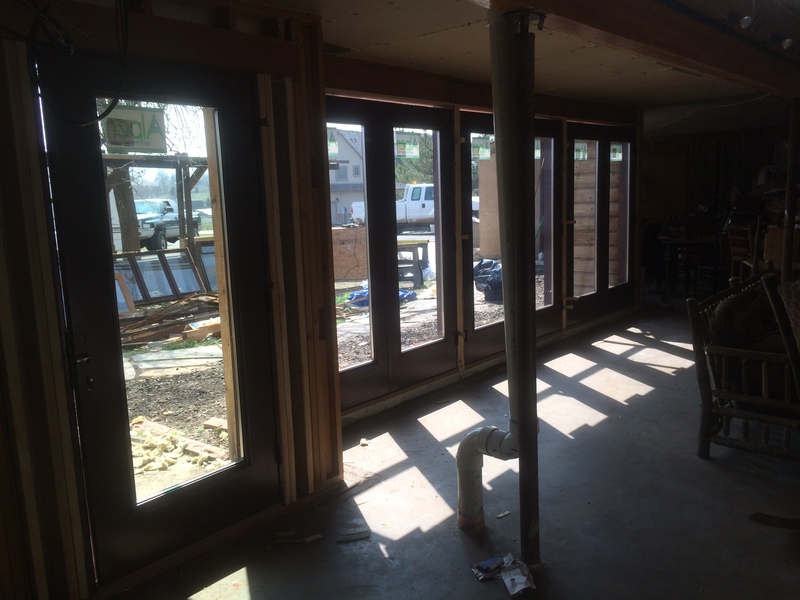 The first area they tackled was tearing out and reframing the large southern window exposure for french doors. 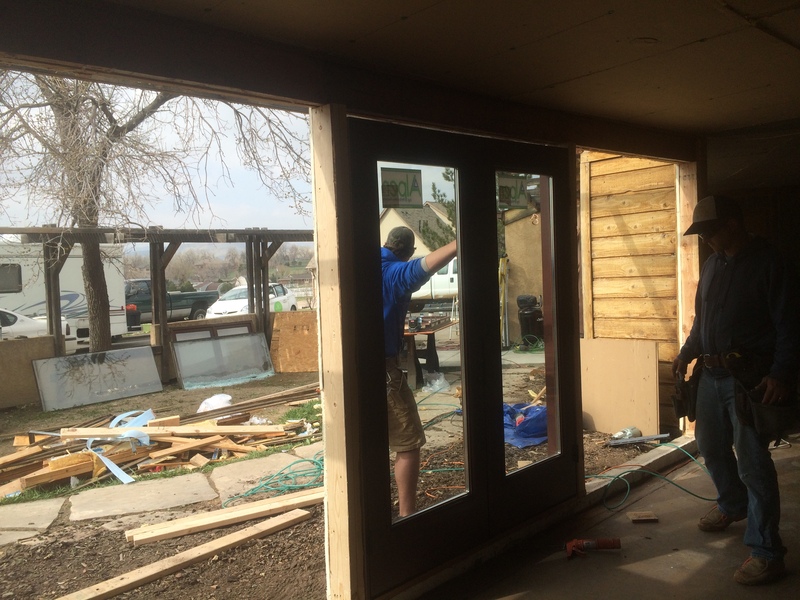 The door crew was not quite up to speed, although more experienced, they first framed the large door area for the 36″ doors! I was out and about and when I returned and saw the framing I said WHOA. What is going on here? Before I left I had told the head guy that the new doors would fit in the opening with more than one 2 x 6 between them. I wanted to be sure he understood the spacing and reinforce what I discussed with the Efficiency Matters folks. Instead, he asked the guys to give him the door measurements and they must have measured one of the front doors, so he assumed that was the three doors to install! I told him there were 201 inches of rough openings for the doors and 211 inches available in the full opening. Obviously he was not really listening to me! Don’t know if it is true, but there were a couple of other instances where he seemed reluctant to follow my knowledge of the construction and I just got the idea that it was because of my gender. Maybe that was too quick to judge, but I have seen it before and it makes me feel the same way, or maybe it was because I am “just the homeowner”. But it was definitely a communication barrier that I didn’t have with the window crew. 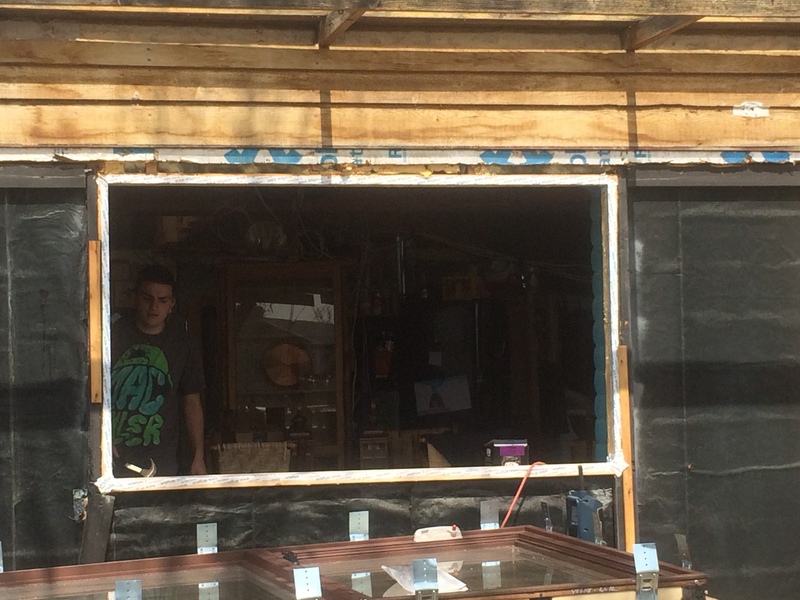 While the door crew was doing their thing, the window crew continued with the window install. Here they have prepared the dining room opening with the Siga tape wrap. 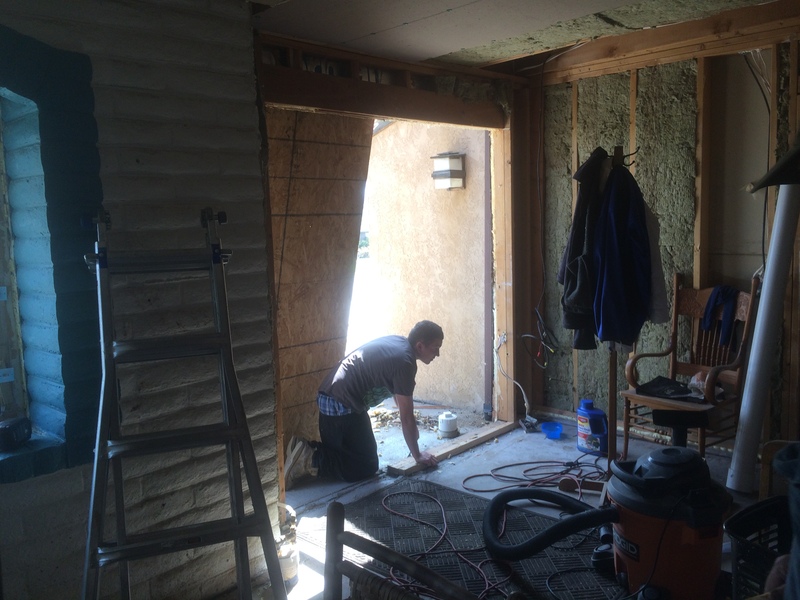 This is the door crew working on the tear out from the former front door and window area. Before long we were looking at a new scene from inside the house. We ran into a problem with the north bedroom window. Somehow it was ordered ten inches too wide! That was a shocker. I checked my spreadsheet and it was an error that I didn’t catch. An earlier quote had the correct size and although I double checked the measurements for the final order, I noticed that my spreadsheet was overwritten on that particular measurement. So I can’t tell where the larger measurement came from but it was a problem for sure. The solution was to just tear out the larger opening! We are lucky that the original construction is post and beam and the builders had used the roof support beam for the window header so the opening was not limited to the original size of the window. There was an insert in the concrete walls that was dry walled. 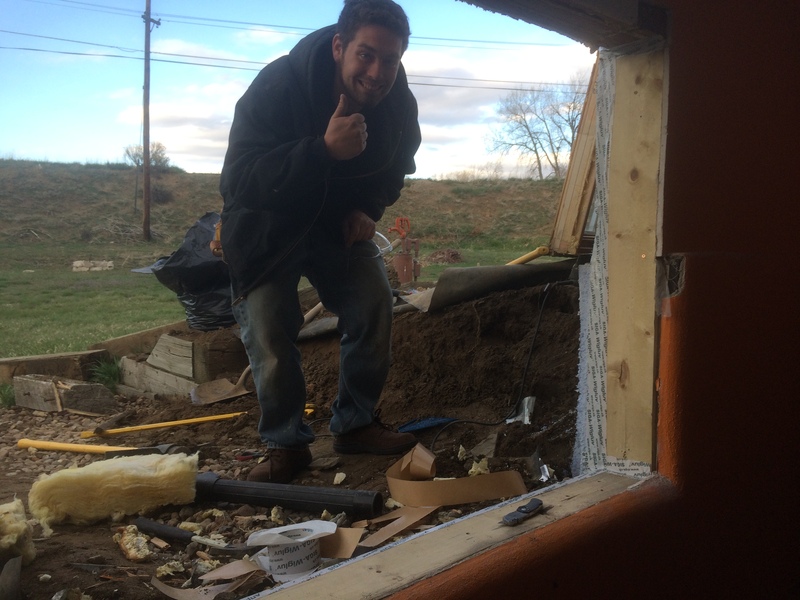 So the crew just cut out to the cement sides and framed for the new window. It fit the space perfectly! Like I had ordered it to do so. Very weird and fortunate. This crew was willing to make it work too. No complaints and they stayed until 7:30 that night getting the window in because we had overnight guests using the room! This window crew was the great. 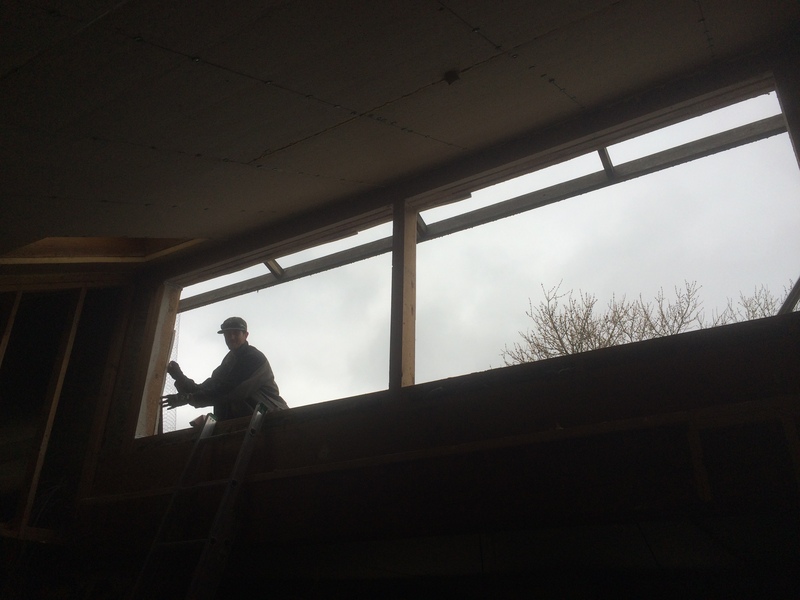 We were very happy with their efforts and the windows are working perfectly. Some of the windows were huge and they were able to carry them up over the back of the roof, resting as they went to get them in place. And finally a panorama of the new southern window and door installation. We are not yet fully sealed up around all the perimeters where new walls were created and the crew has to return for issues with the door installs. But the new look is nice. Even our grandson approves! This entry was posted in Air Intrusion/Thermal Envelope, Construction, Local Products. Bookmark the permalink.